Read Ashley B's review of Glass. From Unbreakable, Bruce Willis returns as David Dunn as does Samuel L. Jackson as Elijah Price, known also by his pseudonym Mr. Glass. Joining from Split are James McAvoy, reprising his role as Kevin Wendell Crumb and the multiple identities who reside within, and Anya Taylor-Joy as Casey Cooke, the only captive to survive an encounter with The Beast. 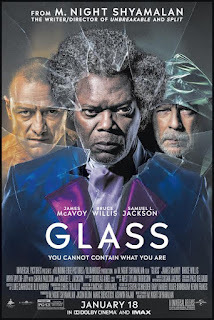 Glass is the third movie following its predecessors of Unbreakable and Split respectively. This time the three men who believe they have superhuman powers are together under the observation of a psychiatrist. Can M. Night Shyamalan deliver a cohesive storyline to bridge the characters or does it not live up to the hype of the movies prior? When the trailer of Glass was released, in true M. Night Shyamalan fashion, viewers were left in the dark of what was to come. This adds an element to the movie of both familiarity with the characters while still being left on edge of their fates. This lasts throughout the movie even more so if you are familiar with the story leading up to Glass. The performances from Bruce Willis, James McAvoy and Samuel L. Jackson were outstanding. Their acting skills were put to the test as they teetered between stability and instability yet they each nailed their roles. It was easy to get immersed into the plot because of this and kept me wanting to see more from each of them as they shared the big screen. Where this movie got jumbled and took a turn to the left was toward the end. 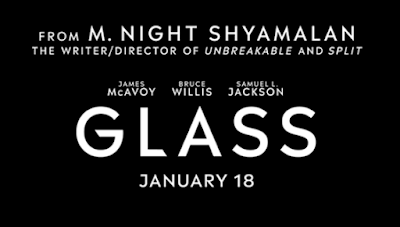 If you are familiar with M. Night Shyamalan’s works, he tends to pack in a lot into a movie especially toward the end and Glass is no different. Since the plot is slow for most of the duration of the movie it is hard to process quickly even when you know what’s going on. The twist, depending on how you look at it, is very hit or miss with no real in between. I felt like it was a bit of a let down because it was a “seen that before” type of ending which was not much of a groundbreaking of a plot in my opinion. If you are looking to see how the three stories are intertwined then I recommend watching Glass. Despite its flaws in having all the excitement pushed toward the end it still will draw you in due to its slow build up.